TamilNet: 04.12.10 "Sovereign Immunity question is a matter for U.S. Supreme Court"
"Sovereign Immunity question is a matter for U.S. Supreme Court"
The U.S. Justice Department responding to a query by Tamils for Obama, a US-based activist organization, in August of this year, on the immunity against arrest of heads of state accused of war crimes visiting the U.S., said, "as a matter of general policy, the Office of the Solicitor General does not state or provide opinions on such matters unless such questions arise in the context of Supreme Court or other appellate litigation." The response was received during the week of controversy of the attempted arrest of suspect war criminal Major General Chagi Gallage, a member of Mahinda Rajapaksa's entourage to London. During the same week a leaked cable from the U.S. Embassy in Colombo revealed that U.S. diplomats believed that "responsibility for many alleged [war] crimes rests with the country's senior civilian and military leadership, including President Rajapaksa and his brothers and opposition candidate General Fonseka." 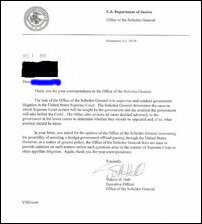 The letter further explained, "The task of the Office of the Solicitor General is to supervise and conduct [U.S.] Government litigation in the United States Supreme Court. The Solicitor General determines the cases in which SUpreme Court review will be sought by the government and the position the government will take before the Court. The Office also reviews all cases decided adversely to the government in the lower courts to determine whether they should be appealed and, if so, what position should be taken." Tamils for Obama also wrote to the Supreme Court chief justice John Roberts. The Organization is unlikely to receive a response from the Chief Justice. U.S. Constitution prohibits the Supreme Court from giving "advisory opinions." Article III, section 2 of the US Constitution authorizes the federal courts to hear several types of "cases' and "controversies." The Supreme Court has interpreted these words as giving rise to a series of limits on judicial power, and one of the limitations is the prohibitions against giving advisory opinions. That is, absent an actual dispute between adverse litigants, the Supreme Court will not issue any opinions. 02.12.10 Rajapakse, brothers responsible for alleged War Crimes in Sr..